Welcome to FramedGuidons.com. 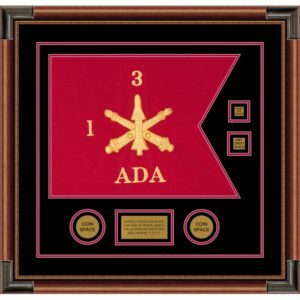 “Framed Guidons” is your source for non-regulation guidons used for display purposes in standard and custom framed guidon packages. 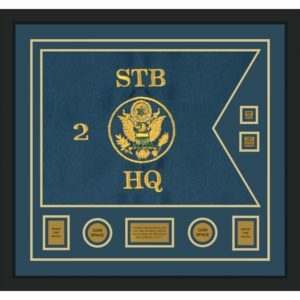 Our guidon business is organized and designed to sell cotton and or nylon blended embroidered guidons as part of a premium guidon framing package. 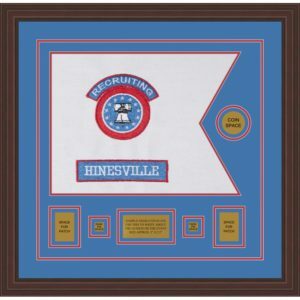 Our guidons are not sold individually. Rather they are sold framed, utilizing a number of pre-selected combinations of mats, frame styles, and objects which are incorporated into the framing design. 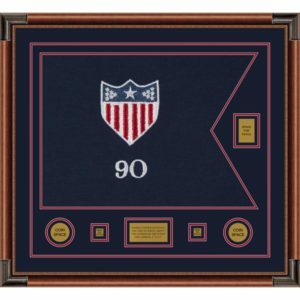 Years of custom framing experience for military customers has narrowed the selection process for the designs, mats, colors, and objects into the most popular framed guidon packages. 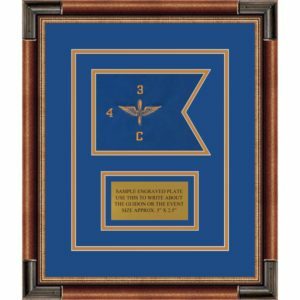 Our guidons are single-side, only suitable for framing and are non-regulation precisely sewn for superior display quality in a framing package. 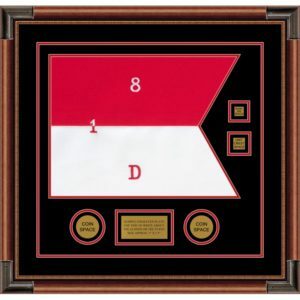 We have simplified the buying experience for framed guidons. 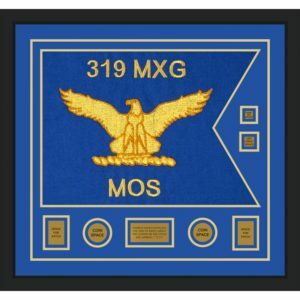 There are four sizes of guidons available: 7”x 5”; 12” x 9”; 20” x 15” and 28” x 20”. Every guidon size is available in 3 design configurations. Each design utilizes the placement of objects such as crests, coins, rank pins, patches, military insignia, and a nameplate in different opening configurations around the guidon. For each guidon size and design, there are 3 different frame profile styles and colors from which to choose. 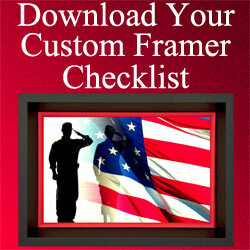 Although this website bases its design on a simplified e-commerce store, we are custom picture framers. We are not locked into exclusively selling the packages in the e-commerce store. For example: if the mat colors, frames, or anything else in the design selection does not meet your requirements, we can customize a design to suit you. Also, if you have a guidon you wish to furnish and have framed in one of the standard packages, we will gladly accommodate you. If you wish to furnish a guidon and have us do a complete custom design, we can offer that option as well. Feel free to contact us at sales@framedguidons.com or by phone at 912-756-2781 with any design options questions or guidon inquires. Example of Custom Framing The Flag of The United States Army. This was presented as a retirement gift. 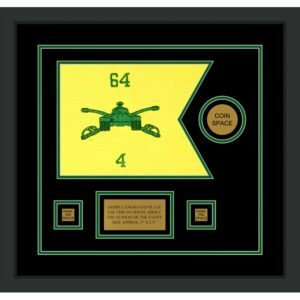 The framed guidons and framed flags we produce utilize conservation framing techniques. This means the exclusive use of acid-free mats, materials, and 99% UV protected glass or acrylic as the framing components. In addition, all of our guidons are sewn onto acid-free mats to prevent sagging or slipping inside the frame over the years. We have an extensive section on the quality that goes into our custom framing. You can read more about our quality in our Quality And Design Section. An important section on this website also addresses our pricing policy and the benefit of an investment in quality framing. To read more, please go to our Pricing Policy Page. We salute our military customers, and we are here to serve you. Feel free to contact us at any time about your framed guidon questions or design inquiries. 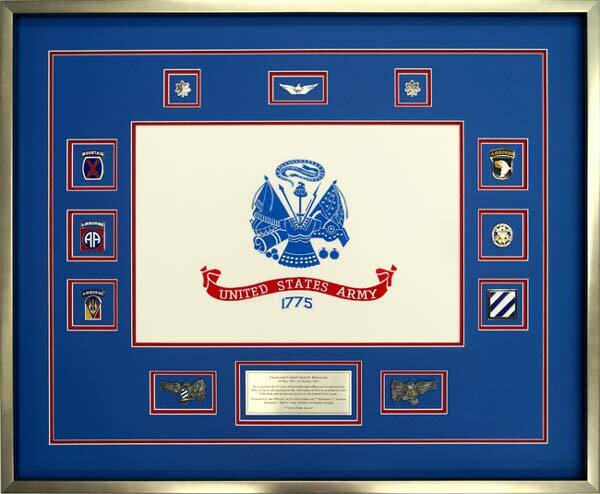 We specialize in framing military projects for retirement, change of command, PCS presentations, military shadow boxes, and much more. We invite you to read the About Us Section for additional information. For our local customers, we are a division of Cindy’s Custom Framing & Antique Art located at 10070 Ford Avenue, Richmond Hill, GA. 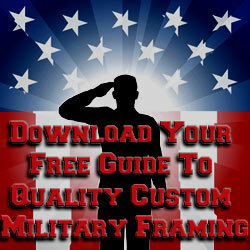 Phone us at 912-756-2781 or email us at sales@framedguidons.com.